Listen, I'll say right off the bat: I don't think any person in the history of ever has picked up one of HP's Pavilion x360 models and thought "I can't wait to use this thing as a tablet." Sure, HP sells them on that notion, the same as Lenovo with its Yoga line. But there's no getting around the simple fact this thing is a terrible tablet. It's oversized, it's heavy, and it's cumbersome—as a tablet. As a laptop, though? The HP Pavilion x360 11T Touch Select (phew, say that five times fast) is a damn good compromise between portability and performance. Keep that hinge firmly clamshelled and you'll be golden. When you're only spending $500 on a laptop, the last thing you want is a laptop that looks like it only cost $500. Let's give it up for HP then—the Pavilion x360 is sleek. The model HP sent us for review was a gorgeous cherry matte color (black interior), and the "Hewlett-Packard" stenciled underneath the screen is a classy touch. I'd say it's a toss-up between this, HP's other machine (the 15t Touch), and the Dell Inspiron 5000 Series for most attractive. They're both phenomenal looking compared to the competition. I should clarify, again: Phenomenal looking for a laptop. As I mentioned, the Pavilion x360 is one of those "ultra-flexible" laptops where you can bend the hinges around 360-degrees and turn it into a "tablet." It looks ridiculous, not least because the Pavilion x360 has a massive bezel. This is one of the least tablet-y tablets I've ever seen, bulky like a football player trying to fit into a tutu. You might as well call a Lite-Brite a tablet at that point. So let's pretend that mode doesn't even exist and just review this as a laptop, shall we? The one upside of the "tablet " mode is that the Pavilion x360 comes fully equipped with an 11.6-inch, 1366x768 IPS touchscreen. It's one of only two laptops we looked at with an IPS display, and it makes a huge difference compared to the shoddy TN panels most machines come equipped with at this tier. The touchscreen aspect is a decent bonus, if you're one of those people that doesn't mind smearing fingerprints all over the screen. The Pavilion x360 has an option for Core M with an SSD. I'll also give some credit to the large bezel. While it looks somewhat ridiculous and chunky, it did allow HP to put a full laptop-sized keyboard into the 11.6-inch Pavilion x360. The difference is immediately apparent if you compare it side-by-side with the half-sized keys of the Acer Aspire Switch 10. The keys aren't half-bad either, although the travel is shorter than I'd like for lengthy bouts of typing. Like the Lenovo S21e, the Pavilion x360's trackpad is undersized—about half the size of a normal trackpad. But the S21e's trackpad was precise and responsive to compensate for its small size. The Pavilion x360's is not nearly as refined, with some difficulty recognizing scrolling and click-and drag motions in particular. For ports, the Pavilion x360 features a single USB 2.0 slot and a card reader on the left side, plus the volume rocker and power button. The right side is adorned with an Ethernet port, HDMI out, two USB 3.0 ports, the Windows button, and the audio jack. Which brings us to sound. This year's Pavilion x360 ditches the previous Beats branding for greener other pastures, this time partnering with B&O. The audio company, not the railroad. The speakers are actually decently loud, but like the S21e and the Acer Aspire E-15 the speakers are located right on your legs. Thus the Pavilion x360 sounds quite loud and bassy when you hold it in the air—it sounds great, actually. But then you put it on your legs and the sound is (surprise!) muffled. 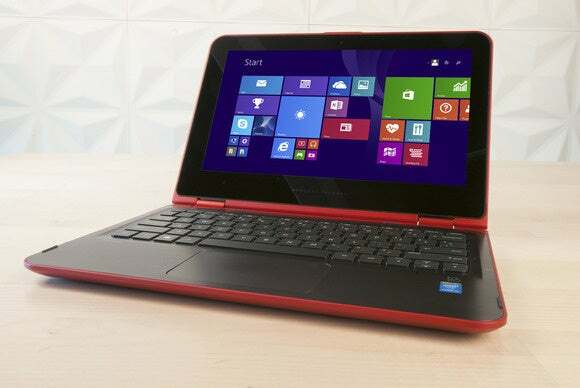 The HP Pavilion x360 features a Core M CPU which is a power-sipping cousin to the Core i5 CPUs. Good looks isn't the only thing the Pavilion x360 has in common with the Dell Inspiron 15 5000. Performance-wise, the two are practically neck and neck. Sort of. This is one of those cases where we get to take a look at the science behind benchmarks, and how they can be misleading. See, we ran PCMark 8 on both machines, and they turned out very similar scores. In Home Conventional, for instance, the Pavilion x360 scored 2,113 to the Inspiron 15 5000's 2,210. Those are pretty damn close. Ditto for the Creative Conventional (HP: 1,902 and Dell: 1,933) and the Work Conventional (HP: 2,636 and Dell: 2,436). 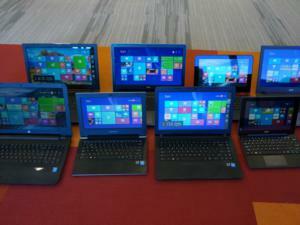 In fact, the Pavilion x360 actually outscored the Inspiron 15 5000 in that last test! "OK, what's the problem?" you say. Well, scores don't tell the whole story. While the Pavilion x360 and the Inspiron 15 5000 both scored very similarly in benchmarks, the setups they used to achieve those scores could not be more different. 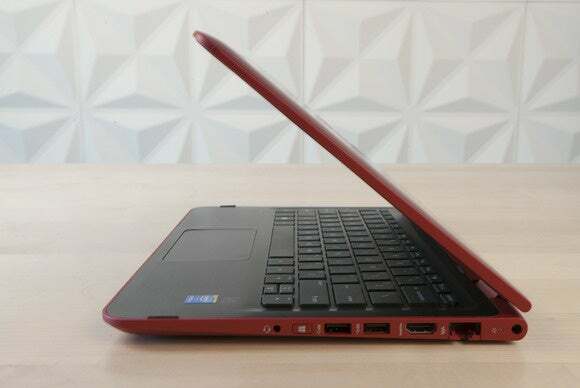 The Inspiron 15 5000 (and the HP 15t Touch for that matter, which scored almost identical marks) is a very traditional sort of laptop with an Intel Core i3 processor clocked at 2GHz, integrated Intel HD 5500 graphics, 6GB of RAM, and a 1TB 5400 RPM hard drive. Aside from the hard drive, those are some fairly nice parts for a $500 laptop. The Pavilion x360, by contrast, packs an Intel Core M-5Y10c processor clocked at 800MHz (up to 2.00GHz Turbo), integrated Intel HD Graphics 5300, 4GB of RAM, and a zippy 128GB SSD. Thus the Pavilion x360 feels speedy, but for entirely different reasons than the Inspiron 15 5000. One relies on its Core i3 and extra RAM, while the other makes up for the slower Core M with an SSD. How does that affect you? Well, day-to-day it won't, as long as you're mostly doing web browsing and word processing. However, the Inspiron 15 5000 obviously has more storage available, and its processor would generally be better suited to more intensive tasks. You can see this in our Handbrake test—it took the Pavilion x360 3 hours and 43 minutes to transcode a 30GB file, where the Inspiron 15 5000 took only 2 hours and 55 minutes. On the other hand, the Core M draws far less power. It's your call which is more important. The biggest downside of the Pavilion x360? It is loaded with unnecessary/unwanted programs. Like the rest of the laptops we looked at, HP packed in a trial of McAfee a.k.a. that antivirus software you should probably replace with something better. It doesn't stop there though. There are also apps for TripAdvisor, Dropbox, CyberLink, Microsoft Mahjong, Netflix, WildTangent Games, Amazon, mysms, Next Issue, Evernote, and The Weather Channel. There's even an app called "Snapfish," which gave me SuperFish PTSD for a second before I realized the name was different. This thing is stuffed to the gills with third-party software, which is made more offensive by the fact you only have a 128GB SSD drive to work with. It all seems safe, but please: Uninstall, uninstall, uninstall. We actually took a look at the Pavilion x360 last year and came away unimpressed. At the time it was powered by a Celeron processor and equipped with a terrible TN panel. What a difference a year makes. The HP Pavilion x360 11T Touch Select is by no means a perfect laptop—it could use a better trackpad, better keyboard, and ditch the rotating hinges gimmick altogether in favor of a better processor or slightly larger SSD. But for under $500? This is a damn good all-arounder, fit for both day-to-day usage and light work. Plus it packs performance on par with the Dell Inspiron 15 5000 Series, the HP 15t Touch, or the Toshiba C55-C, but in a much more mobile frame (and one that sports a much nicer IPS display). That makes the Pavilion x360 a solid contender for the under-$500 crown. The HP Pavilion x360 11T isn't a performance wunderkind, but it has the look and feel of a much more expensive laptop thanks to fantastic craftsmanship, an IPS display, and SSD storage. Bulky, especially in absurd "tablet mode"